For the past fifteen years the Austrian artist Hermann Präg has focused on light as his inspiration and his medium. His latest work uses the new TALEXXchain CRYSTAL SELECT units from Tridonic. Dornbirn, Austria – "Woven Light" is the title of the impressive exhibition that opened on July 1, 2011 in the Centre for Art and Media Technology (ZKM) in Karlsruhe. The exhibition was preceded by a "Woven Light" competition organised by Ettlin AG to mark its 175th anniversary in cooperation with ZKM and sponsored by Zumtobel. The theme was the artistic challenge of creating new lighting designs made possible by the interaction between the new Ettlin lux fabric and point light sources, in particular LEDs. Artists, designers, architects and students from European academies and universities were invited to explore the creative and artistic possibilities of this new high-tech material. This fabric produces interesting effects when illuminated by point light sources – lines of light are created that radiate out and produce three-dimensional light structures with exceptional depth perspectives. From the 150 entries the jury of distinguished professionals selected the works of 23 candidates for exhibition in the ZKM centre – including a two metre high column by Herrmann Präg. Up to now, Hermann Präg has been favouring fluorescent lamps and acrylic as the basic materials for his works of art. The artist now faces the creative challenge of working with a new material and LEDs as the light source. The concept of "shaped light" runs through his entire body of work. Hermann Präg had this to say: "Light is shaped, in other words dots and strips of light are spatially changed. They can be stretched and bent. The result is floating light with a depth effect in various forms." Dept of field plays a special role here. Like the photographic principle, distant light shapes appear blurred. "The acrylic acts like a diffusing screen", he added. For the competition, Hermann Präg wrapped a two metre high and 30 centimetre wide acrylic cylinder in the new material. There was a choice of three types of fabric. The silver fabric, which the artist decided to use after a series of experiments lasting several weeks, produces a diffused beam of light with lines that get wider as they get longer and run into one another. The material is relatively opaque so the construction inside the cylinder remains a secret for the observer. A vertical acrylic plate acts as a light guide and divides the cylinder. It is also used to attach the LED modules on both sides at irregular intervals. The lighting effect of individual LEDs is also changed with Plexiglas elements. In searching for suitable light emitting diodes, Hermann Präg was impressed not only by the performance of the TALEXXchain CRYSTAL SELECT LED chain but also by its brilliant crystal white light colour with a colour temperature of 7,500 K. "I've never seen such light before", said Präg. There is not the slightest difference in colour tone or brightness to spoil the effect throughout the life of the system of around 80,000 hours. The design fabric covering of the column cause the light from the LEDs to be diffused, extended horizontally and bent by the shape of the cylinder. 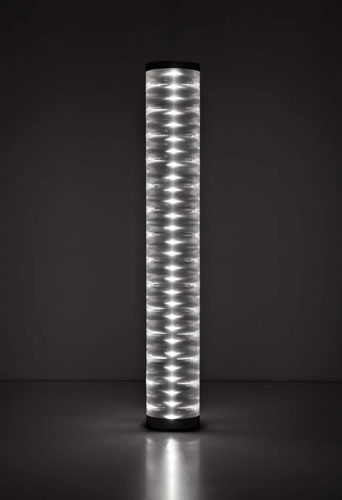 The light fills the body of the column and gives it its volume - like a glass cylinder filled with water. Depending on the viewing angle and the distance the observer is away from the column, the effect changes, giving an impression of three-dimensional floating lights.